Although we are still working toward and end goal with our Personal Training here in Epsom, I just had to share these results so far. 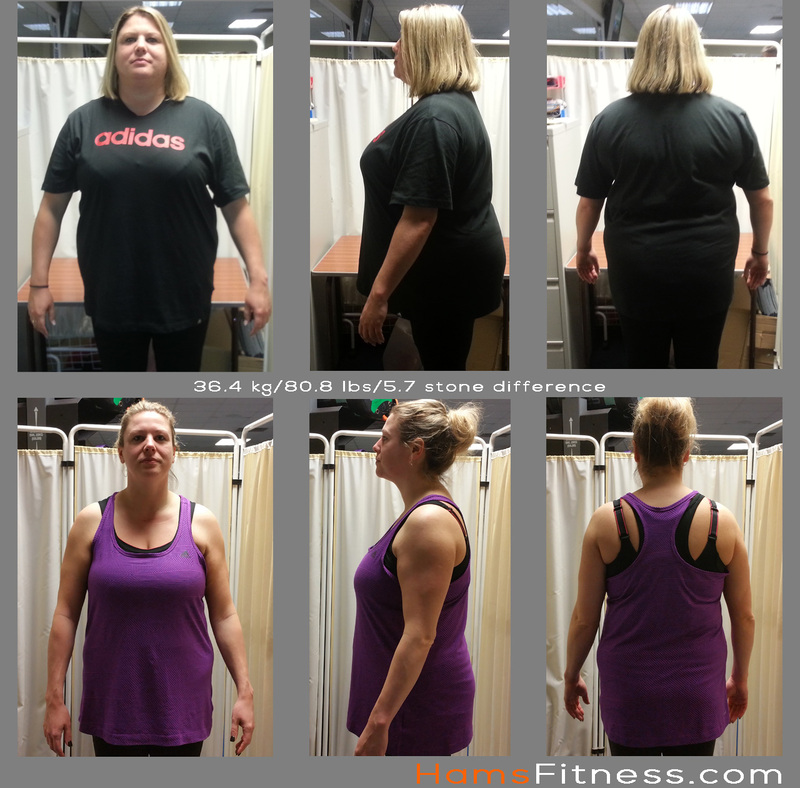 Without question, Hayley has been the most dedicated over the long haul with her diet and I am so proud and happy with the results so far. These photos show a total loss so far of 36.4kg / 80.8 lbs or 5.7 stones and these aren’t even up to date! More has been lost since but I’ll save those pictures for another occasion. “For anyone reading this debating whether to go for it or not – GO FOR IT!!! 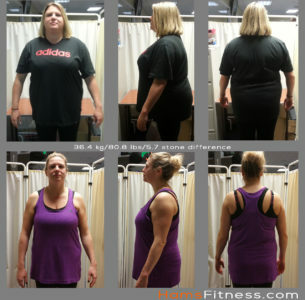 I hesitated for months, watching the weight creep up and up, before I made the call to Richard at Hams Fitness – I wish I’d have done it sooner. When I first started training I had zero confidence levels in myself and the way I looked, I was so self conscious of working out in a gym around other people, one of the reasons I had left it so long. The environment at Epsom is friendly with everyone focused on their own sessions – none of this posing in mirrors you get at other gyms! I’ve been training with Rich for just over a year and am edging closer to the milestone of losing six stone; I feel so much more confident in myself, I feel better, I look better and my body shape has changed as well as the pounds coming off. I enjoy my sessions with Richard, I never dread going to the gym, it never feels like a chore. The sessions are varied and enjoyable, every session planned in advance and logged to compare numbers to in the next workout. I notice my fitness levels and strength increasing from session to session, beating previous records in times, reps or weight. Rich pushes you to be better each session, giving encouragement when your mind is telling you to stop and your muscles are burning! I’ve learnt a lot about the reasons we do a particular session or exercise, the muscles we’re targeting and the effect it will have. We also talk about diet and nutrition, calorie intake and the importance of protein, compare meals planned for the week and where to adjust if necessary (I’ve also learnt a lot about 80’s classic movies – another area of his expertise!!). Are you ready for a transformation of your own?